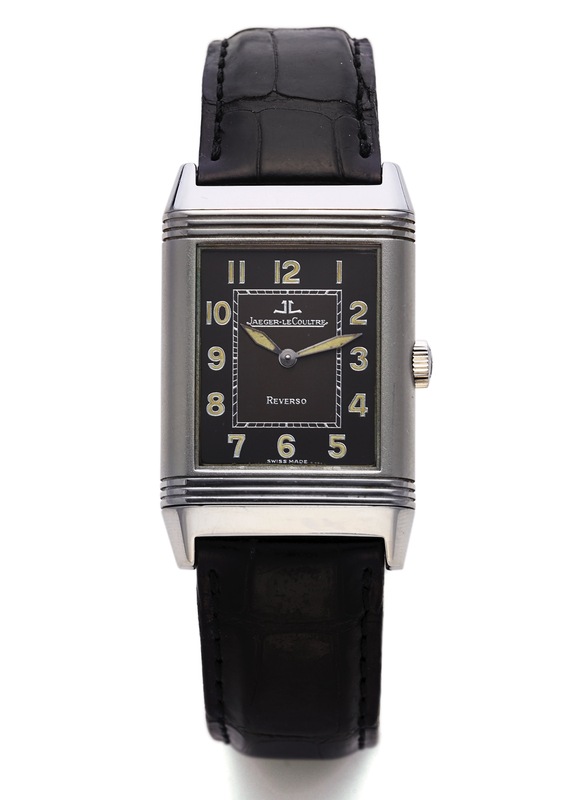 JAEGER LECOULTRE REVERSO STEEL Jaeger-LeCoultre, Reverso Shadow, case No. 1727675, Ref. 271.8.61. Made in the late 1990s. Fine, rectangular, water-resistant, stainless steel gentleman's reversible wristwatch with Jaeger Lecoultre deployant clasp. Five-body, polished, reeded top and bottom bezel, sapphire crystal. Black/brown with luminous Arabic numerals on a plain reserve. Luminous steel "Lozenge" hands. Cal. 822, rhodium-plated, "fausses côtes" decoration, 21 jewels, straight line lever escapement, monometallic balance, shock-absorber, self-compensating flat balance-spring. C. Five-body, polished, reeded top and bottom bezel, sapphire crystal. D. Black/brown with luminous Arabic numerals on a plain reserve. Luminous steel "Lozenge" hands. M. Cal. 822, rhodium-plated, "fausses côtes" decoration, 21 jewels, straight line lever escapement, monometallic balance, shock-absorber, self-compensating flat balance-spring. Dial, case and movement signed. DIM. 26 x 42 mm. THICKNESS 10 mm.